We've had a lot of fun talking to adoptive mom and author Julie Gumm this past week. Today, the author of Adopt Without Debt gives us a few specific ways to drive back your debt and save towards your adoption. At the heart of this conversation, Julie combats the problem: 'You have been called by God to adopt. Now how do you afford it?' Today we discuss several tips from Adopt Without Debt - from simple measures like planning ahead your family's dinner menu and packing your lunch, to using your talents to bring in extra income... and taking a good look at what sits in your driveway. See the conversation here by video and continue it by commenting on this post. What have you cut back on to reach your goals? Adoption without Debt: part 2- ideas to save you money from Children's Hope International on Vimeo. Next time with Julie, return to discover her favorite fundraiser and more savings tips. For Julie's full cost-savings arsenal, purchase her book via her website Adopt Without Debt. This series is a part of CHI-TV - video by Children’s Hope adoption experts and professional guests, answering questions important to you and your adoption. Giveaway: Win a Copy of "Adopt Without Debt"! We have our winner of "Adopt Without Debt" by Julie Gumm! Congratuations to Anne Marie, selected by our Random Number Generator. We hope this book helps make your adoption even more affordable! It is a Giveaway Friday! 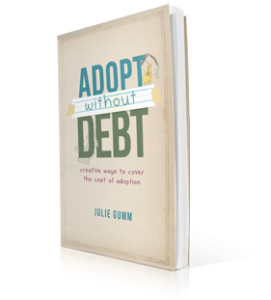 "Adopt Without Debt" author Julie Gumm is coming alongside CHI-TV for several segments on the topics of fundraising, cost-savings, and the biblical call to care for the orphan and the widow. "Adopt Without Debt" collects many great budgeting and debt reduction techniques inspired in part by personal finance guru Dave Ramsey, and continues deeper bringing dozens of fresh ideas on how to raise and earn funds towards your adoption. Julie poses the challenge - "Adopting without debt IS possible." We came away from the book inspired by Julie’s personal adoption story and encouraged by concrete advice and a full appendix of grant opportunities, resources and websites. An added bonus was an introduction to like-minded organizations with innovative ideas such as Both Hands, which gives adopting parents the tools to partner orphan care with work for the widow in an inspiring, hands-on way that truly speaks to the heart while removing the financial barrier of adoption. Get your own copy of the new book "Adopt Without Debt"! Julie has given us a copy to give to you. Keep the book to help you conquer the finances of adoption or give the book to a friend that is considering adoption but is afraid of the financial costs involved. Post a comment on this blog post or on Children's Hope Facebook, letting us know how this book may impact your adoption journey or your friend's (if this will be a gift!). Add your email address in the comment. We will contact you by email if you are a winner. Each item you do will get you ONE chance to win (for a total of 3 chances), if you already do any of these things, they DO count! So make sure to comment for each item; you must leave each entry as a separate comment or only one comment will count. 1. Join Children's Hope on Facebook. 2. Follow @childrenshope and @jgumm on Twitter and tweet the following statement then come back to this post and tell us you tweeted. -This giveaway is open to USA residents only and will run until Monday, June 13th at 11:59 pm CST. -Winner(s) will be generated via a random number generator software program. Winner will be notified via the contact email provided in the comment or by Facebook message. -Winner(s) will have until 6/15/11 to claim their book or we will choose another winner. -Winner will receive one copy of "Adopt Without Debt ". Product will be shipped by Julie herself. As you are preparing to outfit your home for a new baby or adopted child, you have likely been spending a lot of time online and at the local department store stocking up and registering for parenting items. New items are created every year making daily life for more convenient and efficient for moms and dads. With new technology available, what should you look for? There are many resources that help, including the National Parenting Publications Awards. NAPPA's expert judges and family testers (parents and kids) evaluate products to find the most entertaining, appealing, safe, educational, age-appropriate and enduring products - and naming them NAPPA Gold and Honors winners. Find the 2011 award-winning products for babies, toddlers, big kids, tweens and Mom & Dad, on the NAPPA website. The items become more impressive when you see them in action; check out the video below to see featured products demoed live on Fox 25 Boston.